When the Crucial® MX100 was released, it set a new standard for SSDs that the Crucial MX200 pushes even further. Leveraging leading specs on all fronts, along with new Dynamic Write Acceleration technology, the Crucial MX200 is loaded with innovative features and immediately increases your system's performance. 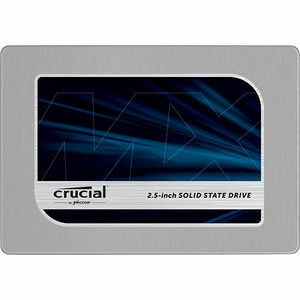 The Crucial MX200 delivers 555 MB/s sequential reads on both compressible and incompressible data, and outperforms a typical hard drive by 400 MB/s. Even better, the performance doesn't let up, as the Crucial MX200 posts an endurance rating that's up to 5 times greater than a typical client SSD. Keep personal files and sensitive information secure from hackers and thieves with AES 256-bit encryption - the same grade used by banks and hospitals. The Crucial MX200 meets or exceeds all industry encryption standards, including Microsoft® eDrive, IEEE-1667, and TCG Opal 2.0.